Warning: This page is for advanced users. Beginners should take caution and also pay close attention to what’s required for each output connector. For example, if you’re getting video directly from the chip, you’ll need resistors and capacitors for some systems. Please proceed at your own risk. 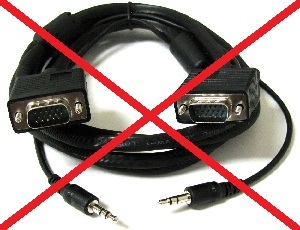 I’d like to start by saying that using a VGA connector will not make your RGB game consoles output a VGA signal! Please keep in mind that a connector is just that: A connection between two points. 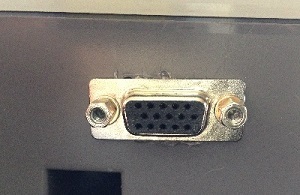 Most people see the connector pictured above and think “VGA”, however it’s actually called a “15-Position Female D-Sub Connector”. 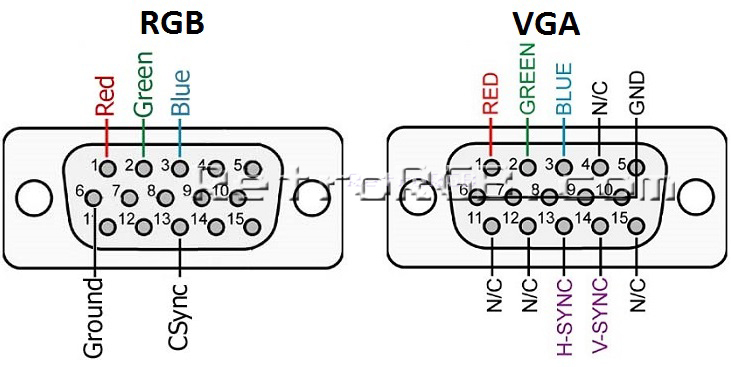 The terms “VGA” and “RGB” describe a signal which can be routed through any connector you choose. I’ve never run into a situation where I needed to wire things different from the “RGB” picture, but if you’re having issues with ground, you could always try the other ground pins from the VGA pic. Also, if you’re having sync issues, you can try using pin 14, or even both 13 & 14…but I’ve never run into that situation either. If you ever find a need to wire ground or sync differently (that isn’t the result of a bad cable), please let me know. That being said, I doubt you’ll have any issues. – People often think it’ll work with a VGA monitor, no matter how much I try to explain it won’t. Since this connector would be separate from the main system’s output, you can modify them any way you’d like. I actually used this to test the video output of a 1CHIP SNES: Using this connector allowed me to switch between RGB from the multi-out and RGB-bypassed output (through a THS7314) to test the differences in real-time. I’ve also used these to replace faulty A/V outputs on some systems. I had a Japanese Master System with a finicky A/V-out. Instead of trying to replace the old one (and risk damaging the board when removing the original), I just soldered new wires directly from the video-out chip on the board to a VGA connector. It was a perfect and very cheap fix. If you’d like to see what kind of switches will take advantage of these connectors, please head over to my SCART switch alternatives page. If you’re interested in console mods, head over to the main mods page. Otherwise, I invite you to head back to the main page and see what else this site has to offer. I strongly recommend both beginners and novices check out the RGB Guide.